Portland, Oregon, like many large cities, struggles with supporting its homeless population in a dignified way. According to Multnomah County, there are almost four-thousand homeless individuals sleeping on the streets on any given night in and around Portland. Several thousand more are managing to find a roof to sleep beneath but don’t have a permanent place of their own. With rents increasing drastically from year to year, it’s an issue that’s not going away, but there’s an attempt underway to develop an inspiring new approach. 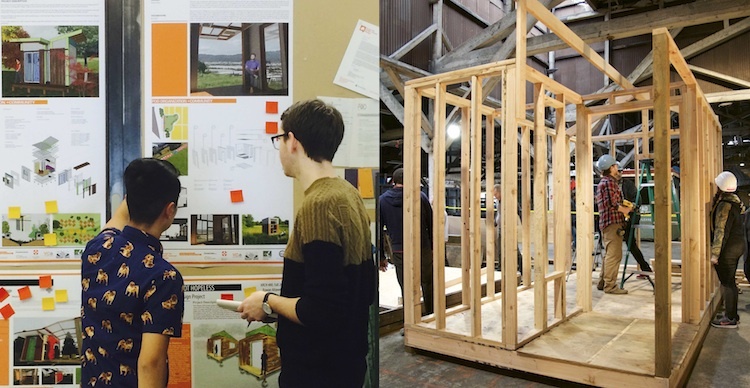 The Partners on Dwelling (POD) Initiative is striving to design and build a village for houseless women in a Portland neighborhood. One of the city government’s standard approaches to address the homelessness issue is to periodically conduct “sweeps” to clear camps from under bridges or other areas where people congregate. The tactic seems to do little other than displace the victims of the sweep, with no real positive results to show for it. In 2015, a group of people camping on a piece of vacant land and their supporters successfully deployed direct action and advocacy to resist a scheduled sweep. As a result of that victory, the Hazelnut Grove community was established at the site. It became an intentional community of houseless individuals who worked together to form the village and develop governance over the site. The new village began receiving donations and materials to improve the site, and volunteers pitching in. Community organizations that facilitated the donations and volunteerism began meeting with the organizers of the village. They formed the Village Coalition to develop a vision for how communities like Hazelnut Grove could be used to reduce the number of people living without shelter and security. Todd Ferry first started attending the meeting as an interested citizen. He is a professor in Portland State University’s Center for Public Interest Design (CPID). He recognized that, while the already established villages were having some success, the architecture and design community could fill an unmet need. According to their website, CPID “aims to investigate, promote, and engage in inclusive design practices that address the growing needs of underserved communities worldwide.” It seemed like a great project for the center to participate in. 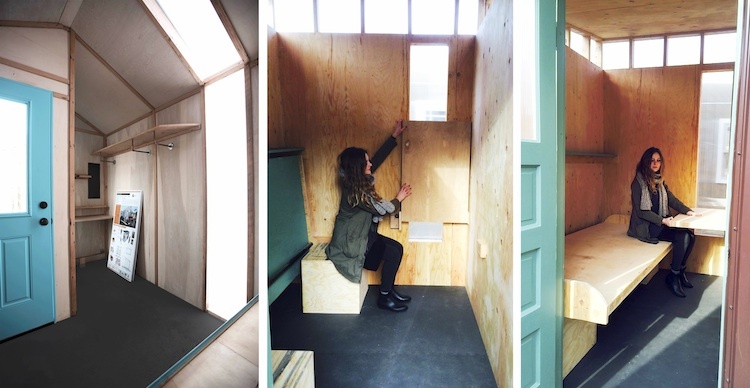 “Good design has the ability to improve quality of life, change public perception, address complex social issues, and empower communities, which are all goals of the POD Initiative. Architects have a unique set of skills that allow them to use the power of design to these ends and improve the built environment for all,” Todd told me. 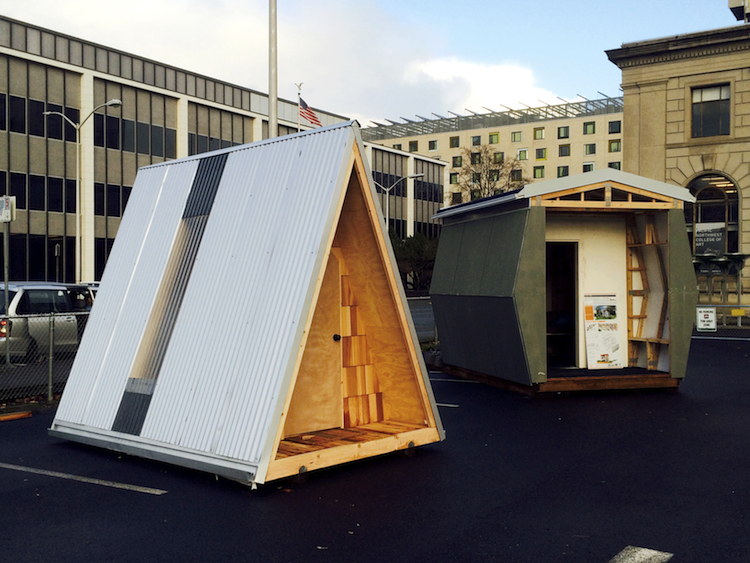 Todd and POD Initiative collaborator Mark Lakeman, of City Repair and Communitecture, invited several architecture firms to participate in designing and building prototype sleeping pods. The firms and CPID created fourteen distinct designs. They found a warehouse and gave themselves three weeks to build them. The results are incredible. So much function is consolidated into very small spaces. They are all secure, nice places, and have tons of aesthetic appeal. They’re well-insulated for comfort and allow for natural light. The designs were reviewed by residents of Hazelnut Grove along the way to ensure they were meeting the needs of those who would hopefully be sleeping in them. While design professionals have the skills and knowledge to produce quality dwellings, the houseless people were considered the experts. 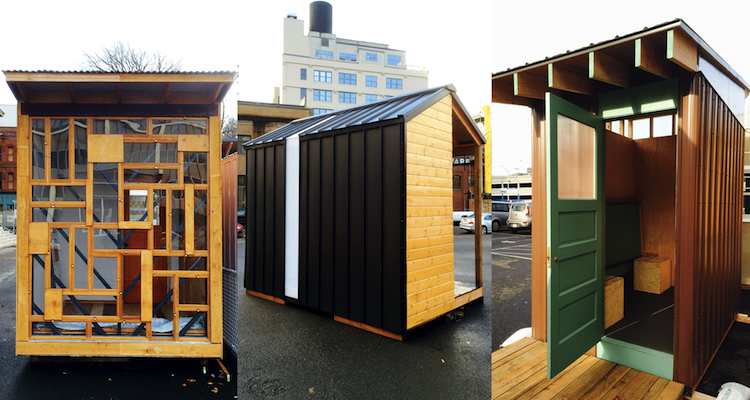 “It has been amazing to see Portland’s architecture community come together to develop thoughtful new visions for addressing homelessness in our city with houseless individuals and other stakeholders,” Todd said. In the fall of 2015 Mayor Charlie Hales declared a state of housing emergency due to the number of people sleeping on the streets and the lack of affordable housing. The POD Initiative was quickly adopted as one viable option to help address the problem. One way the city government was particularly helpful was by relaxing building codes. The dwellings meet safety standards – they’re all required to have an operable window, for example – but they’re not required to have bathrooms and kitchens. Three standard sizes were developed for continuity. With the help of professional architects, designing and building the dwellings is the easier part. Finding a suitable piece of land to place them on is much more difficult. A property owned by the Portland Development Commission, a quasi-governmental land development organization, was identified as the site for a new village to be developed, but it was first met with skepticism. Some local residents and business owners felt the plan was being implemented without hearing their concerns. 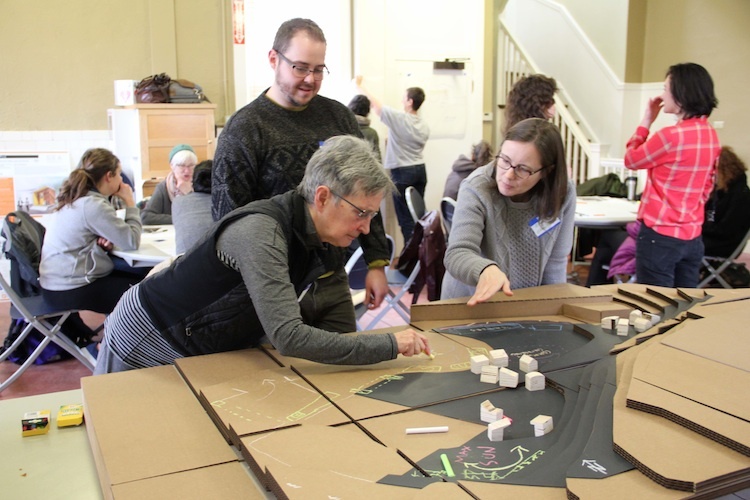 To address the needs of the surrounding community, the Village Coalition, CPID, and other partners held a community design charrette that included homeowners, business owners, architects, advocates, and people who have experienced homelessness. Around a hundred people participated in identifying potential problems and coming up with solutions. Putting stakeholders with competing needs in the same room to work through issues may have helped people overcome their fears of this new approach and gain some understanding and acceptance. “It feels very collaborative and engaged. I think that there’s a much better chance now,” says Susan Oliver, a Kenton resident who attended the charrette told the Portland Tribune. “It has been inspiring to see local neighbors participate in public meetings or a design charrette, educating one another about the positive role this village could play in their community,” says David Bikman of the Village Coaltion. Alesha Hase, one of the CPID students working on the village design, showed me a conceptual plan of her ideas. She had taken information gleaned from the design charrette and applied it to the site. Her preliminary design includes a visitor space where family and friends of the individual village residents could visit without disrupting the privacy of other residents. There is a common workshop/crafting area, a quiet outdoor space towards the back, and gardens. The individual dwellings don’t have kitchens or bathrooms so there are shared areas for those services. The more space devoted to amenities means fewer people can be housed there, which is an indicator of a different mindset with this project. There seems to be a real intention to make this a welcoming, comfortable space for the residents and not just a place to house as many people as possible. In the political culture of Portland, finding the right process is extremely meaningful. Getting it right can make or break a movement. The POD Initiative seems to have taken the right steps to earn approval from the surrounding community. Overcoming stigma would be a huge success for this effort, and is critical if it’s to be replicated. “The process of building consensus around the mission of the village with such a broad range of public and nonprofit stakeholders has been slow and incredibly valuable. This deliberative process has allowed the wisdom of neighbors, people with lived experience of homelessness, advocates and activists, and government leaders to be heard and incorporated into the plans for the village. The team organizing this village, including City and County leaders, has high hopes that the collaborative design process being employed in Kenton will prove to be a template that will enable the establishment of future similar villages elsewhere in the city,” says David. The village has support from Portland’s new mayor, and funding from the city and a small, local foundation. Even so, it’s not a done deal. Each resident, business owner, and property owner in the Kenton Neighborhood will have an opportunity to vote on the proposed village on March 8. The project could technically move forward without the consent of the neighborhood association but that’s generally not how things work in Portland. The voice of participatory democracy is most often honored. A denial of the proposal would likely send organizers searching for another suitable site. Even if the proposal passes, finding safe, comfortable dwellings and a welcoming community for fourteen women is not going to solve this complex issue. Thousands of people will still be living on the streets once it’s built and the new residents move in, but Todd sees much greater potential for this approach than just one village. Something bigger might be happening.